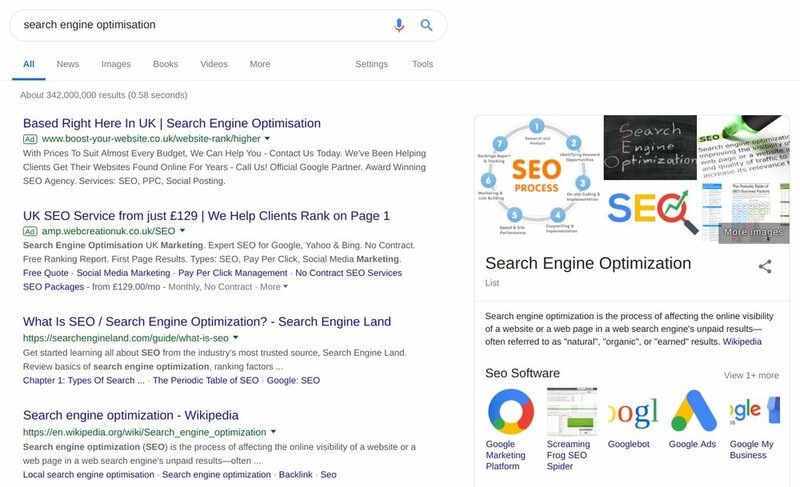 Search engine optimisation (SEO) is the process of improving the online visibility of a website or a web page in a search engine's unpaid results - often referred to as "natural", "organic", or "earned" results. A Search Engine Results Page (SERP) with paid and organic placements. Your past, present and potential customers are always asking questions. If you can answer those questions succinctly and demonstrate that your website is an authoritative source of information, you stand a better chance of being found in each searcher’s moment of need. It is important to note that both parts of SEO are essential to your website’s success and your brand’s reputation online. SEO requires a close working relationship with your website designers and developers, your content marketing partners be they copywriters, bloggers, PRs or rich media producers and finally with you: to get to the heart of your business, brand and audience. Search Engine Optimisation is not a box-checking exercise and it’s never “done”. The second your website starts to look “dated”, is the second you start loosing potential business. Complete the form below and one of our SEO experts will be with you in a moment.